The Red Bulls and NYCFC met for the first time on Sunday, and while the fledgling club was no match for its established counterpart, the first New York derby proved exciting—and its future is even more promising. HARRISON, N.J. — Replacements in American English exist for just about every British term in the lexicon of the beautiful game. A “kit” is a uniform. A “pitch” is a field. “Football,” of course, is soccer. Yet somehow, for as many sports as there are in the United States, and for as many cities that have multiple teams playing the same sport, there is no adaptation for the British use of “derby:” a rivalry game played between two teams with claims to the same city. Its usage in the U.S. is almost entirely limited to portions of proper nouns. A horse-racing event. Or, perhaps, a hat. 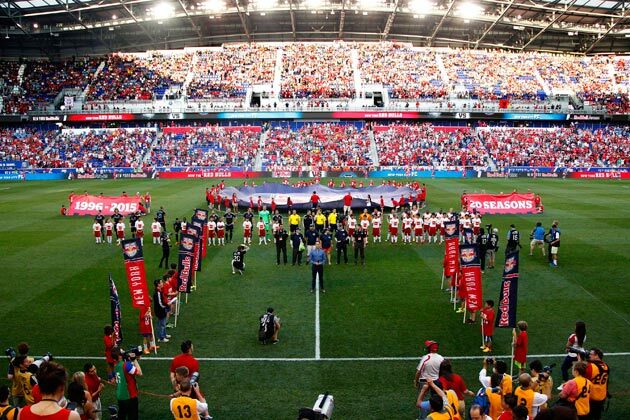 After the New York Red Bulls’ 2–1 win over New York City FC on Sunday, that linguistic quirk has every reason to change. The game pulsated with energy, flowed with graceful attacks and rumbled with hard fouls and controversial calls, with all of that amplified by a sold-out crowd of 25,217 at Red Bull Arena, including over 1,500 NYCFC fans who made the trip across the Hudson. It was, for lack of a better word, a derby. ​Funny, the concept of a rivalry existing here seemed unrealistic at first. On one side you had the Red Bulls, a Major League Soccer original that has spent 20 years building a fan base in New Jersey, while constantly trying to gain relevance in New York City. On the other, there was NYCFC, created out of thin air with the vast monies of EPL side Manchester City, from which the club took its name (hence it being a “Football” club). The expansion team is just three months into its inaugural season. It’s only played five games at home. One has been trying to “own” the nation’s largest metropolis for two decades. The other has only just started trying to do so. There seems to be precious little fuel for a derby there. The River-Boca Clásico, the North London Derby, the Old Firm—games like these carry the weight of historical significance whenever they occur, because both sides are embedded fully in their communities. Not to mention the fact that, in most cases, the teams have played against each other a boatload of times. “I tried to downplay the rivalry aspect of it,” McCarty said of the first installment of this matchup. “But when the other team brings 2,000 fans and they’re loud, you always want to win. You always want to shut ‘em up. That’s obvious. Walk among both sets of fans, talk with them, and it’s not hard to discover the catalyst that gives derbies a life of their own. “Because they’re there” is far and away the most common response. While the game did end up feeling impressively like a derby, it still played like a game between an expansion team and one of the best sides in the league. The Red Bulls were dominant from the start. Bradley Wright-Phillips opened the scoring just four minutes in thanks to Lloyd Sam, who created nearly every dangerous opportunity throughout for the Red Bulls. On one of his first forays forward, Sam fired in a nice cross from the right endline, and with no defender within five yards of him, all Wright-Phillips had to do was tap it in to the raucous roar of the home fans. “It’s always a great feeling to score in a derby,” said Wright-Phillips, who knows something about that. From 2010 to 2012, he scored four goals in four derbies for Plymouth against Exeter City in the English League One. ​​With the Red Bulls on top so early, the game looked as if it could be a rout. The events that happened next made things far more interesting. First, NYCFC endured the roller-coaster emotions of a disallowed goal when Chris Wingert was correctly called offside after finishing nicely on the bounce of a freekick sent in front of goal. He wheeled away in celebration, but it didn't last long. Then the Red Bulls were down a man. Matt Miazga, the 19-year-old who will now be off to the U-20 World Cup with the United States, got his marching orders after getting a second yellow card thanks to a clumsy challenge on Khiry Shelton in the 36th minute. In short order, Red Bulls coach Jesse Marsch brought on Karl Ouimette to replace forward Mike Grella and take Miazga’s place at the heart of defense. Grella, a Long Island native, pulled his shirt up over his nose and mouth after crossing the sideline, yelling loudly and intensely into the back of the fabric. The lack of a man forced the Red Bulls to rely on the counterattack. They excelled at that, too. Sam provided the genesis moment for the second goal on one such counter, breaking free on the right flank and lofting a beauty of a cross-field ball to Sacha Kljestan. The former Anderlecht man waited until Wright-Phillips found space, then split two defenders with an inch-perfect pass. Wright-Phillips showed a finisher's touch right in front of the South Ward, which responded to the 2-0 lead with louder cheers and a plume of red smoke in the 52nd minute. They nearly had the chance to do so again shortly thereafter, when Josh Saunders was forced into denying Wright-Phillips his hat trick on a breakaway. NYCFC’s frustrations showed. On one foray forward, RJ Allen was able to fire a ball across the face of goal that begged for a scoring touch to put it over the line. When none came, Allen kicked the advertising board behind the goal. Not long after, NYCFC coach Jason Kreis elected to make changes. Two players that NYCFC has built much of its identity around, Mix Diskerud and David Villa, came out, replaced by Patrick Mullins and Kwadwo Poku. On his way off, Villa exchanged words with Kreis, and looked sullen as he sat on the bench. His manager played down any talk of a rift. Diskerud, on the other hand, “was not great tonight,” Kreis said​. Only after the stars sat down did NYCFC look consistently dangerous. In fact, the work of the subs led to NYCFC’s only goal of the game, as Poku set up Allen for a cross into the box and Mullins beat all the Red Bulls defenders to the ball and made things 2-1 in the 76th minute. When NYCFC was able to break free of a compact Red Bulls defense, something inevitably went wrong. Poku was able to find space at the top of the box in the 88th minute, but a heavy touch betrayed him and the ball got cleared out. Similar plays to Poku’s can happen dozens of times in every MLS game. Few come with that many eyeballs on every move, with that level of pressure, so early in a season. Few come with the weight of a derby. Poku slapped the ground rapidly as the home crowd cheered.